Friday night, after the Cards/cubs game (and replay) was over, I was watching the Yankees/Red Sox. Once that was over, I switched to the Reds/Brewers tilt. (Wife went to bed early, and the kids are at their dad’s this weekend) After that glorious walkoff, I kept the party going, and switched to the Cleveland/Oakland game. Half of those games were relaxing, leisurely baseball enjoyment. The other two were a little more important, as far as I’m concerned. Westbrook went out Friday afternoon in the Wrigley sun, and did what he’s been doing in his last few starts. He sucked. In his last four starts outings, Jake has surrendered 24 earned runs (20 of which in the last 3 appearances). He’s not had more Ks than BBs since July 24, which was a pretty good outing: 7IP 9H 3ER 0BB 2K, W (vs. PHI…at Busch). Since that time, he’s really struggled, though the August 7th game isn’t really fair to call his. At least he went 6 2/3 on Friday, he hadn’t gone more than 5 since that July 24th start. Frankly, that’s not good enough when you’ve got a starter that’s struggling like that. Good teams are able to wade through muck sometimes when their pitching struggles, because the defense and/or hitting picks them up. Vice-versa-vice, vice-vice-versa, or whatever it would be called when you introduce a third scenario. What really grabbed my attention was brought up in an exchange I had on twitter following Lucroy’s walkoff bomb off Chapman (which was almost as cool to see as Denorfia’s a couple weeks ago, but more exciting because of the NLC implications). 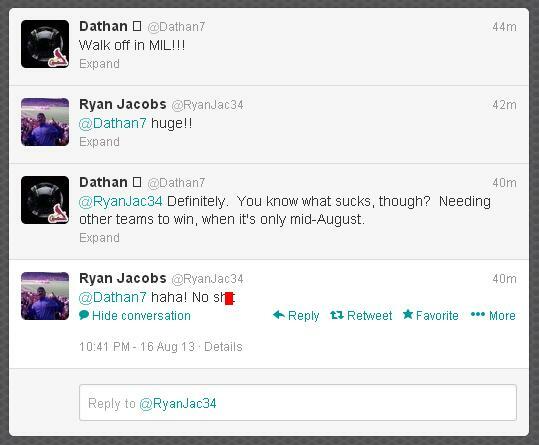 It’s not good when on August 16th, your timeline blows up over a Brewers-over-Reds game just having ended. It’s far too early to be so reliant on other teams, folks. For most of the season, this has been a Cardinals team in charge of their own destiny, and for a few weeks now, they just look lost most of the time. Turning to the Brewers, hoping they can beat the Reds to keep the Cards from falling into (gasp!) third place? Not good, man. Not good at all. I’m not here to preach gloom & doom, though. I’ve long said that I’m a self-proclaimed ‘realistic optimist’, though I’ll save you the trouble of looking, and openly admit here to writing the words, “this isn’t 1964 folks” back in 2011. As magical as things were going at the time, surely the Braves wouldn’t “pull a ’64 Phillies”, would they? Well, we know how that turned out, and I’m happy to have been wrong. Gene Mauch probably was too. The reason for my optimism is fairly easy: The schedules. Awful lot of cupcakes sittin’ out there between now and the end of September. Even the games that aren’t are division games, like that CIN-PIT-CIN-PIT stretch after ATL comes to Busch. The Cardinals’ future is in their hands, and there’s really not much need (or at least shouldn’t be) for relying on other teams to “help us out” at this point in the season. I know what you might be thinking, and Pittsburgh’s schedule the rest of the way is fairly soft, too. But with games left against the Cardinals (as long as the gap doesn’t get too wide), anything can happen. Oh, and tip your cap to ol’ Abner, because just as the Redbirds wrap up their regular season against the cubs, the Pirates finish their regular season against who? The Cincinnati Reds.